Television could move into a new age with a "listening" virtual TV guide which can switch channels at the command of the viewer. The guide, which has been developed in Norwich, is an electronic programme built around an animated virtual human. It was created to help people with sight problems. 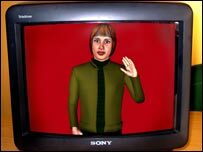 The software chats to viewers about what they want to see, a computer linked to the TV uses voice recognition programmes to accept their answer and then switches the set to the correct channel. Created by the Vista consortium, which includes the University of East Anglia (UEA) and Norwich-based animation company Televirtual, the guide has won a Royal Television Society's national technical award. Mark Wells, Televirtual's research director said: "The talking programme guide will be a great help to those people, often the elderly or those with sight problems, who find ordinary guides and menu systems confusing or difficult to read." Dr Stephen Cox, of the UEA's school of computing sciences, said experiments had been carried out to see how the guide would react to a viewer's voice. "The results of these experiments have been used in the design of an improved system, and we hope to carry on this research in a follow-up project," he said. The project has spent 18 months linking up electronic programmes guides, supplied by another of the project's partners Sky TV, to the virtual guide. City University in London, the University of Manchester, speech experts Sensory and the Independent Television Commission were also involved with the development. Dr Jonathan Freeman, who led the project, added: "It's like having your own virtual personal assistant to help you make up your mind and then do what you want." No release date has yet been set as the guide as there are plans to develop the technology further.